CrossCode is an RPG that demands your full attention at every turn. Whether it’s solving puzzles, completing quests or surviving the many battles, you need to be on your toes. Honestly, it’s exhausting. But I don’t mind the strain. Indeed, I’d rather more RPGs pushed me in this fashion. Perhaps it’s just the focus on puzzles that permeates every level of this game, but I had to work for every victory. That only made said victories all the sweeter, however. Your story is something of a puzzle, with much of your history lost to amnesia. It’s a little trite, but it works to reinforce the overall theme. You do get a glimpse of your badass former life, moments before it’s all ripped away. In that sense, you’re working your way back to your ideal state. You play a Seeker, or rather, you play someone in a Seeker avatar in the midst of a game called CrossWorlds. Unlike the other players, you don’t log out and you don’t remember your life outside of the game. It’s a variation of a rather tired story trope that I find a little refreshing. At least, playing someone like this is leagues better than watching someone like this. The writing involved didn’t always hook me, but the bones of the story kept me sufficiently invested. On top of that the dialogue had some pretty great moments. It’s revealed early on that your speech systems are busted, forcing your handler to hard code each new word into your avatar. Your first few interactions are a veritable cavalcade of Hi’s, peppered liberally with some vigorous head-nodding. It’s a nice touch. Every enemy you encounter is another mystery to solve. What will be the right pattern? Where will their weak point end up being? After a little while fighting regular enemies, I got complacent enough that it started feeling like a grind. This feeling vanished as soon as I faced my first boss. Your stats, gear and levels are all secondary considerations. The true test is one of reflexes and strategy. The upside to the tough-as-nails boss fights is that winning one of them feels like a genuine accomplishment. After a string of cruel deaths, you get the pattern just right and eke out a win. Or, you can slowly level-grind your way to victory. The choice is yours, really. While I found myself frustrated by the pace at times, the game’s weird rhythms held a sort of zen power over me regardless. Take the trading system for example. Running around the map foraging for items could be a righteous pain, it can also be quite relaxing. Maybe this is just a peace I’ve come to associate with the act of grinding away in RPGs in general, but there’s real value in that routine, if you’ve got the mindset to find it. CrossCode’s aesthetic presentation is a major factor in how peaceful I find it, though. Pixel art is a common occurrence in games these days, but I’ve said it before and I’ll say it again: good pixel art is always worth it. CrossCode looks just terrific, from the characters to the backgrounds to the truly impressive bosses. Puttering away with the mindless little tasks that most RPGs saddle you with can be either crushing or liberating, and that distinction is dependent on presentation. The music is another high note, especially the bouncy themes for the various towns and regions. 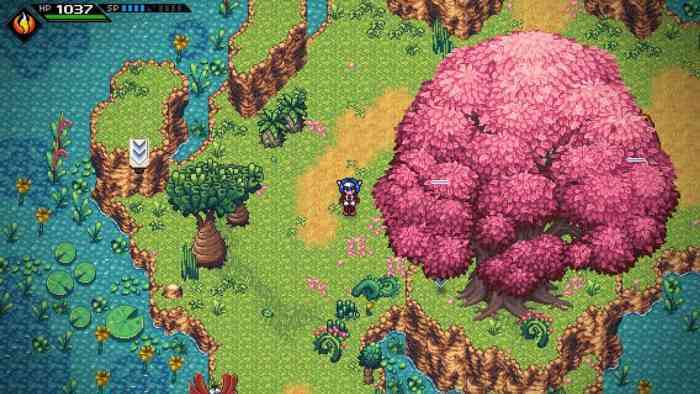 If I’m going to be slaying cyborg bulls and harvesting plants, I’d rather be doing so in a beautiful environment, and CrossCode delivers. The only time this pacing feels out of place is when I’m stuck. Whether it’s a tough boss, a fiendish puzzle or some endless quest, CrossCode’s rhythm gets rather tangled at times. Leveling up feels almost too fast, on the other hand. If I’m ever stuck or ramming my head against a particular enemy, a short span of level grinding finds me barreling through them with reckless abandon. This is both frustrating and freeing. It’s nice to know that I can brute force my way through a brutal encounter, though doing so feels like a failure of sorts. True victory comes with the successful application of strategy. Anything else just feels like cheating. At first the skill tree felt minuscule. I was a third of the way through it in maybe six hours. Then I discovered there were four more trees to max out. Not only did this please me immensely (I do so love filling skill trees) but it immediately added a ton of depth to the combat itself. Suddenly I had an element, fire, to factor in to my strategies. Every successive tree after that added a new element, as well as new skills. Some of these skills even came in handy during the puzzle segments. During the first major dungeon, I was stuck trying to coax an explosive through a regenerating ice barrier. A little (okay fine, a lot) of trial and error led me to the Burst skill, a flamethrower that somehow doesn’t set off explosives. Sometimes the puzzles felt like utterly implausible, like there was no way what I was doing would actually work. It was only after numerous attempts that I would always discover I had it right, I just had to be extremely precise in my application of a clumsy fix. Again, it was a sometimes frustrating process that yielded satisfying results once I succeeded. CrossCode is a mashup of several disparate genres. You’re solving your way through puzzle-laden dungeons, grinding away at MMO-type quests, and cutting your teeth on action RPG combat. For the most part, this combination works. The major drawback for me is that these different genres require different parts of my brain to be active. Jumping from one style of gameplay to the next was honestly a little jarring. The zen peace I find in grinding serves no purpose in the tense boss fights, and even the regular enemies require your full attention at first. On the other hand, the puzzle sections need a whole separate form of patience and concentration. In the end, my love of the grind won out, and CrossCode became that kind of experience in full. I recognize that this kind of patient application may not be suitable for everyone, however. CrossCode is a beautiful world loaded with puzzles of all kinds. 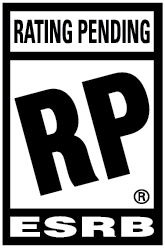 If you can find your center among this storm of separate genres, you might really enjoy this game.